!!! Tuscan must-have! Please, whatever you do…. There are important things to do, and then there are OMG, red-alert, holy-moly-hurry-up things like 2016 LA FORTUNA (this vintage, 2016, is a massive qualitative jaw-dropper, the best in a decade at least) that MUST be obtained. A Last Bottle world-class find (we pat ourselves on the back continuously for discovering this now-super-big-time producer some years ago) --- read more about it HERE on our blog --- but for the sweet sweet LOVE of all that is good and righteous and rip-roaringly fantastic to drink, GET THIS NOW. Best price EVER! The Zannoni family has just completely knocked it out of the park. AGAIN. OK --- DIRECTIONS: receive box with silly grin from FedEx guy. Rip open frantically. Insert corkscrew. Hold on to something as the aroma of this masterpiece causes you to nearly faint. Drink. Savor life and wonder how you can get so much intense pleasure from something that costs $14. 2016 is such a miracle of nature (esp. at our price). Even the base-level Rossos are SHOCKINGLY good, so flavorful and packed with the joyous light-energy of Montalcino. *** sigh *** The purity of the Morello cherry fruit, dried and fresh, the clean, singing licorice note, rose petals, a whiff of dark cocoa powder, and a wonderful, lovely, delicious sort of root beer/sarsaparilla tinge that we cannot get enough of. It is STELLAR. Wonderfully balanced, too. This is a ridiculous bargain and a wine to be consumed as often as possible!! Wow!! 2016, we love you!! While it lasts! We can't get enough of the wines from this stellar family run producer and when a vintage like 2016 comes around, you'll want to load up in a major way and at this price we make it easy! Aging/Cooperage: 6 months in 25 HL Slavonian oak barrels and 6 months in French oak barrels. La Fortuna began in 1907, with Angiolino Zannoni, Gioberto’s great grandfather, growing seed crops and raising livestock. His son Gino followed suit, taking over in the 1950's at a time when the economic landscape was changing dramatically — people were fleeing the land in droves to take manufacturing jobs in the cities. Gino knew he wanted none of that, and so he bought the land his family was farming from the landlord. 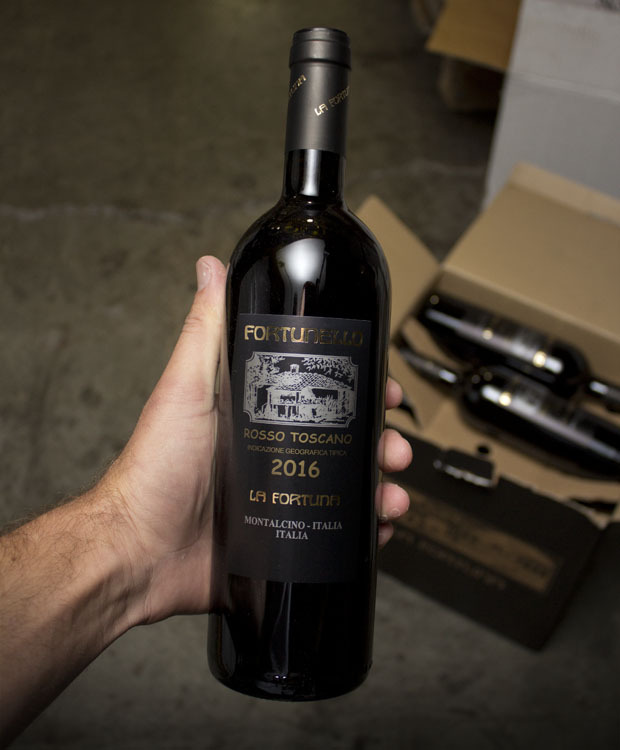 The entire estate is centered around their centuries old Tuscan farmhouse, where the family has lived for over a century. Around 20 acres of vines are planted between two vineyard sites, one near Fulginiae and the other in the south near Castelnuovo dell’Abate. The northern site is a bit cooler, while the southern vineyards are warmer and each year they blend fruit from both locations, the quantity changing depending on the conditions in each. Porcini Risotto with white truffles anyone?